Better late than NEVER!!! LOL. I finally managed to take photos of my projects. Yippee. I had my 3D class a few weeks ago and this is what we made. Usually it is just the 3D project but seeing as Valentines day was a matter of days after the class, I decided to do both the 3D and matching card. Obviously, this is the card!! LOL. I went with traditional 'red' and added some white. I recently purchased the background stamp "En Francais" and boy am I glad I did. It has been on my wish list for quite some time but I just never got around to ordering it! Here is the 3D project - Pizza Box. 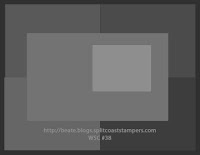 The tutorial came from Jen Del Muro (USA) on SCS. I have the pizza box a few times and just love it. Very easy to put together and quick too. 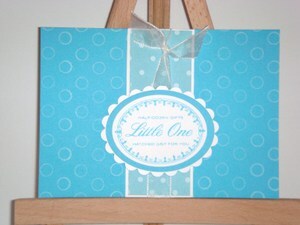 Decorate the box however you like be that simple or elaborate. A view from above. If you know me by now, you know that I love to doodle! If you feel that your project is lacking something and you've already put it together, just add some doodling. You will be amazed at how it can complete your project. Mmmmmm, look what is inside!!! Yummy chocolate. Obviously you can fit more than 4 Lindt chocolates but that is all I had at the time of photographing it.....*she says blushing*. I hope you all had a lovely Valentines Day with your loved ones. Oliver calls it 'Balentimes'. LOL. Oliver has been home sick for the past 2 days - poor thing. He only ever had one day off at preschool whenever he was ill. I might have to keep him home tomorrow as well if his fever hasn't gone. According to the doctor, he has a viral infection which he most likely got from school. Our friends Neill (best man at our wedding) and his partner Kath had a baby boy (Bartholomew) last week and only today did I get around to making them a card! How slack am I? I went out today and bought some 'baby' things they will need and I'm hoping to be able to see them soon to give it to them. I am really happy with this card and you may have noticed that I used the sketch from THIS card. It is so easy and quick and looks great! Here is the close up of my lovely bear. I also used the circle scallop punch and the stitching effect is done with the brocade blue marker. Stamps: SU! - Bundle of Joy, Riveting (retired), Sanded. Ink: Bashful Blue, Brocade Blue. Paper: Bashful Blue, Certainly Celery, Whisper White, DSP Cutie Pie. I have a friends birthday coming up next month and thought of a nice gift set for her (can't giveaway WHO it is!). The notebook is for her thoughts or to just write things down during the day. I even managed to accessorise the pen! I also made the matching card. I've wanted to cover a notebook for ages but have been trying to find the right size. I ended up finding one yesterday while out and bought 10 of them!! The pen was an after thought so that is why I haven't attached it to the notebook. NOTE: remember for next time. I have used Basic Grey paper along with SU! 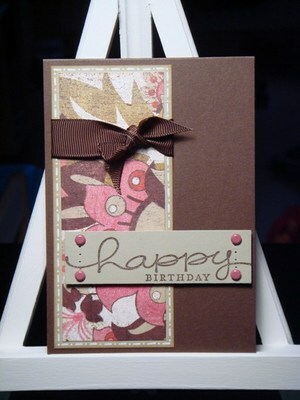 cardstock (Sahara Sand & Chocolate Chip) and the lovely 5/8" grosgrain ribbon in Chocolate Chip. The letter "n" is from the Big Deal Alphabet set. 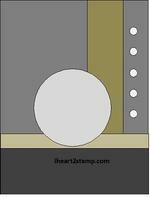 I used my nestabilities to cut out the circles in Sahara Sand and Basic Grey paper. 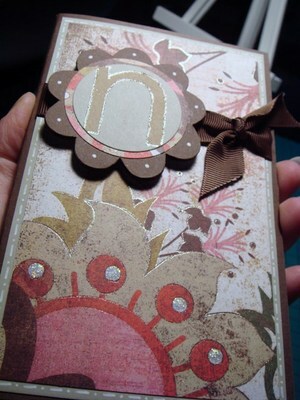 I covered the chipboard flower in Chocolate Chip cardstock and used my white gel pen for the dots. I've added this photo as you can see the sparkle better. I used my gelly roll pen to outline the letter "n" and on the Basic Grey paper. I'm a little late posting this card. I actually finished it on Friday night, just as our visitors arrived. I didn't get to photograph it then we went out to a local zoo on Saturday and were gone for most of the day. A day at the zoo with a 3 year old!! - what can I say! I was too tired to turn the PC on when we got home, although I did end up taking the photos - woo hoo! Can you see in this photo the sparkle?? I used my versamark pad with my stamps along with the 'heat & stick powder', then I used the 'dazzling diamonds' glitter on top! Give this sketch a go! Okay, so I've managed to finish Jens's sketch challenge. I was going to use some DP but in the end I didn't so I stamped the image from the Garden Silhouette set. 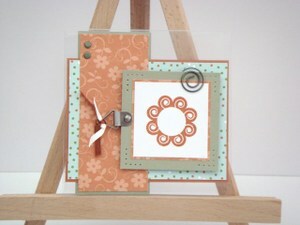 I also used the colour challenge from SCS #160 which was to use Mellow Moss, Creamy Caramel, Apricot Appeal & Cameo Coral. Not a colour combination I would normally put together. I have been wanting to use this sentiment stamp for ages but just never got around to using it. This photo doesn't show the true colours of the cardstock. Here is Jen's sketch - give it a go. This card is a little bright for me. 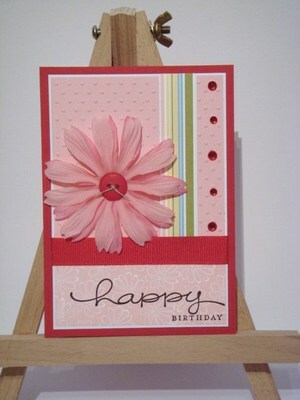 I don't often use Red as the base but I chose the DP first and then matched the cardstock. My 'happy' stamp moved so it is not straight (arghhhh) and as I already had my brads in place, they were in the way of the stamp-a-ma-jig and if I had tried to stamp the 'everything' stamp straight, you can guarantee it wouldn't be straight so I didn't bother. Here are my lovely brads I bought from a local craft shop. I also used the 1/4" Always Artichoke grosgrain ribbon. We had visitors yesterday so I didn't get to do Jen's challenge until today. 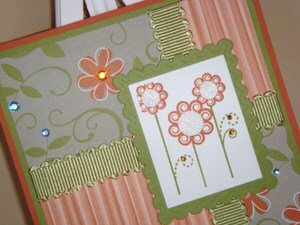 I was wondering what to do but I also received my new cuttlebug embossing folders so I knew I had to use one of them. Here is my finished card. I have a few birthday's coming up in April and one of them is MINE but alas this card is not for me !! LOL My 3 year old son will make my card with the help of my husband. Stamps: SU! - Happy Everything. Paper: SU! - Real Red, Whisper White, Pretty in Pink SU! DP - Petals & Paisleys. Accessories: Linen Thread, Red Grosgrain Ribbon (department store), Prima Flowers, Red Gems. My wonderful friend Monica who lives in Mexico, recently had a baby girl (girls are all around at the moment!) so I used Beate's sketch to make this card. 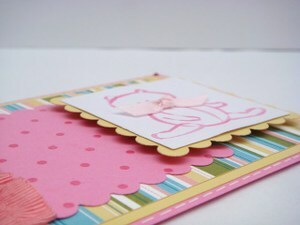 I love the Designer Paper I used in THIS card back in February and it was for another baby girl card so I thought I would use it again. Here is a close up of the teddy bear. I used my new SU! watercolour crayons in Pink Passion. I really do need to practise watercolouring more and normally I can colour in the line but for some reason put a brush in my hand and all my neatness goes out the window !! 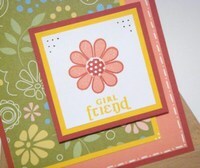 I also used my polka dot stamp on the Pixie Pink cardstock. As you can see I have lifted the teddy off the page. Here is Beate's sketch. Give it a go !! Stamps: SU! - Bundle of Joy, Polka Dot. Ink: SU! - Pixie Pink, Crayons - Pink Passion. Paper: SU! - Pixie Pink. So Saffron, DP = Petals & Paisleys. Accessories: SU! Ribbon Originals - Fairy Tale, 1/4" Whisper White Grosgrain..
SCS Sketch Challenge time. 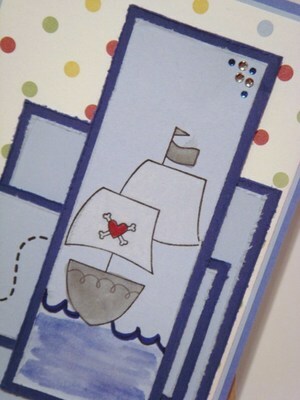 A lot of people were using tall flowers as their image but I decided to use my Ahoy, Matey stamp set. A friend of Oliver's birthday is coming up soon so I thought this set would be a good one to use for him. 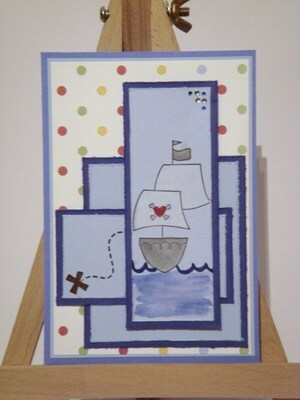 Here is a close up of the pirate ship. 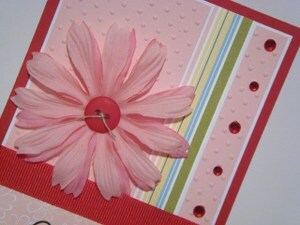 I used my new distressing tool around the edges of the cardstock - the first time I have used it and I LOVE it. Here is the sketch we had to follow. Stamps: SU! - Ahoy, Matey. Ink: SU! Crayons - Brilliant Blue, Charcoal. Paper: SU! - Bashful Blue, Brilliant Blue, Ballet Blue, DP - Cutie Pie. Accessories: SU! Distressing Tool, Bling. I looked at SCS today and the colour challenge really appealed to me. Bashful Blue, Whisper White and Basic Gray. I went out with my friend today and we somehow managed to go to a craft shop......actually we went to two. I don't know how it happened - I think I might need some help ! 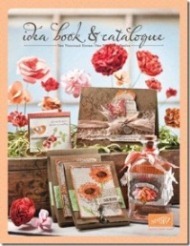 LOL I bought 2 new cuttlebug embossing folders - stylized flowers and d'vine swirl. There are a few more I would like to get. I used the Happy Birthday stamp out of Occasional Greetings. I needed a small stamp. Stamps: SU! - Garden Silhouettes, Occasional Greetings. Ink: SU! - Bashful Blue. Paper: SU! - Bashful Blue, Whisper White, Basic Gray. Accessories: SU! Brads, 1/4" White Grosgrain Ribbon. Woo Hoo.....it's Friday, which means it is sketch challenge time. What do you think of my card - it is a little dark for me but I am happy with the end result. Stamps: SU! - Welcoming Words, Papertrey Ink - Faux Ribbon. Ink: SU! - Bravo Burgundy, Adirondack - Cranberry. 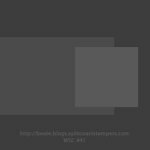 Paper: Basic Grey, SU! - Bravo Burgundy. Accessories: SU! - Hodgepodge, White Ribbon coloured with Bravo Burgundy Marker. I thought I would give this technique a go !! I kind of succeeded for most of it. I think I need to press harder when scoring the lines to make them deeper and maybe not press so hard when putting stamp to paper. Not bad though for my first attempt. I will give this another go. Here is a close up of the butterfly. The lighter pink stamp (Pixie Pink) stamped well and didn't go into the score line but the outline stamp (Pink Passion) went into the score line but I doesn't look too bad, does it?? I added some bling with my gems. I wonder if I'd known I was going to use pink this week as I only bought the gems on Saturday. Stamps: SU! - Bold Butterfly, Welcoming Words. Ink: su1 - Pink Passion, Pixie Pink, Tempting Turquoise. Paper: SU! - Pink Passion, Tempting Turquoise, Whisper White. This card was for our second team challenge. We had to use a particular card as inspiration. It could have been tearing, water colouring or using dimensionals. I used my SU! Markers to colour in the images. They are actually 3 separate flowers I made to look like one bunch. I stamped the sentiment in versamark but I didn't press hard enough as the image didn't come out clearly enough so I used my marker to go over the wording. Stamps: SU! - Oh So Lovely, Wonderful Words. Ink: Black Stazon, SU! Markers - So Saffron, Certainly Celery, Mellow Moss, Pumpkin Pie, Close To Cocoa, Creamy Caramel, Brocade Blue. Paper: SU! - Brocade Blue, So Saffron, Certainly Celery, Whisper White. Accessories: 1/4" Certainly Celery Grosgrain Ribbon, Brocade Blue Brads. 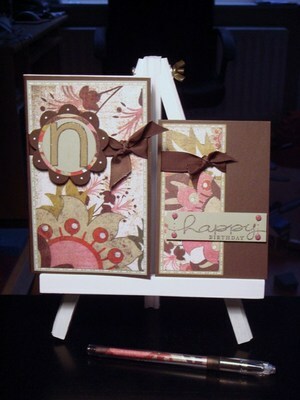 I participated in a team challenge yesterday and the first challenge was to make a pop up card. Again, a first for me as I have never made one of these cards before. The instructions were pretty straight forward. Go HERE to Dawn's blog to follow her tutorial. I thought I would use my 'Bold Butterfly' set as they haven't been out of the box for a while. I also wanted to use some colours I wouldn't normally pick first. Stamps: SU! - Bold Butterfly, Wonderful Words. Ink: SU! - Really Rust, More Mustard, Versafine - Onyx Black. Paper: SU! - Really Rust, Whisper White, More Mustard. 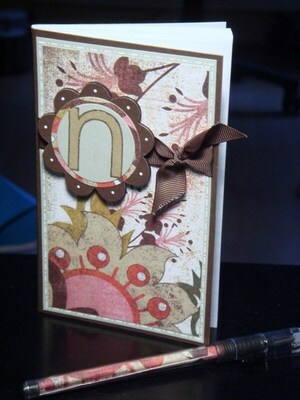 I saw Nichole's acetate matchbook card on her blog HERE and just had to make one. 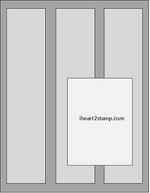 It seems to be the week for first's for me as I have never made a matchbook type card before. I followed Nichole's tutorial - give it a go. Can you see (if you look carefully) the scalloped edge of the acetate. The papers are from K&Co Hannah series. I have the 6x6 pad. Here is view from the top. You can see the white cardstock folded back while it is held in place with 3 brads. I think I will also try to make this with cardstock but using contracting colours instead of the acetate. I'm curious to see what it would look like now. The 'Happy Birthday' senitment is from Papertrey Ink. Stamps: Papertrey Ink - Paper Tray. Paper: Acetate, White cardstock, K&CO - Hannah. I finally finished my card for Beate's Weekend Sketch Challenge !! PHEW ! It is also my very first acetate card - can you believe that !! I also finally got to use my SU! hodgepodge. Stamps: Papertrey Ink - Women Of Life. Ink: SU! - Really Rust. Paper: SU! DP - Fall Flowers, SU! - Really Rust, Mellow Moss, Whisper White. it is sketch challenge day over at SCS and I haven't done this challenge in a couple of weeks so I thought it was about time to start. Here is the sketch we needed to follow. I turned the sketch on it's side as I really wanted to use this stamp set. This time I used 'Women Of Life' stamp set from Papertrey Ink. 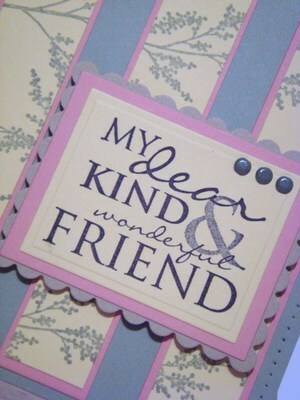 It was designed by Melissa Bickford - check out her blog HERE. Unfortunately, you cannot see that I used crystal lacquer on the centre of the flower. I did use come 'bling' though !! Ink: SU! Pumpkin Pie, Certainly Celery, Old Olive, Versafine - Onyx Black. Paper: SU! - Pumpkin Pie, Real Red, Old Olive, Whisper White. 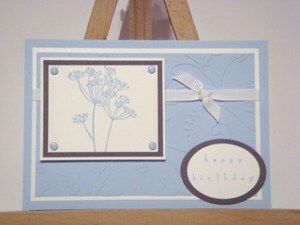 I have taken a few photo's of this card and I cannot get the colour right !! I took one again this morning and it seems to be better. I received my new Papertrey Ink stamps that I ordered. This set is called "Just Hatched". 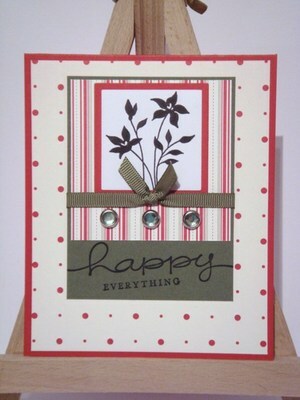 Can you see the Polka Dots in the background .....they are another set released by Papertrey Ink. I should have made this in pink as our friends had a baby girl a few weeks ago and I still haven't made a card - I'm terrible. Just a close up of the beautiful stamp. 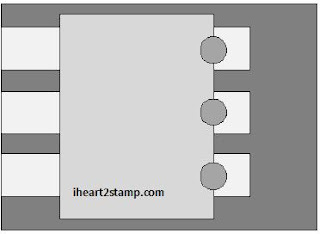 All the stamps from Papertrey Ink are acrylic so you can see exactly where you are stamping unlike the wood stamps. Stamps: Papertrey Ink - Just Hatched, Polka Dots Basic. Ink: SU! - Tempting Turquoise, Stazon White. Paper: SU! - Tempting Turquoise, Whisper White, SU! DP - Petals & Paisleys. Accessories: White Organza Ribbon, Nestabilities - standard & scallop. Today is sketch challenge from Beate. Yay !! I had so much fun with this one - can you tell. My motivation has come back. I really haven't felt like stamping this week. I used my white gel pen for the stitching effect. Godd thing is if your cannot do straight lines (my hand is up), it doesn't matter as it just adds to the effect. Here is a close up of the stitching with my Papertrey Ink flower and text. I also did some paper peircing in the top corners. This is Beate's Sketch - give it a go. 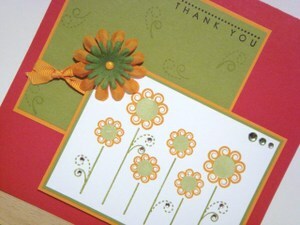 Stamps: Papertrey Ink - Beautiful Blooms. Paper: SU! Cameo Coral, Summer Sun, Ruby Red. Ink: SU! Cameo Coral, Summer Sun, Ruby Red. Here is a card I did for a colour challenge with the Elite girls. Look at the categories on the right under CC Red Summer. It was to use SU! Ruby Red, Cameo Coral and Summer Sun. I don't think I would have thought to put these colours together. I'm really impressed though. I think I will be putting these colours together again. Ink: Black Stazon, SU! Markers - Summer Sun, Ruby Red, Cameo Coral. Paper: Summer Sun, Ruby Red, Cameo Coral. Accessories: SU! Brad - Ruby Red, Circle Nestabilities - standard & scallop. Another day, another card !! Today is Jen's Sketch For You To Try (SFYTT). I must say, this turned out better than expected. 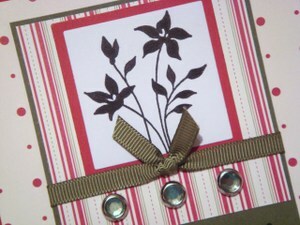 I stamped the bouquet yesterday but I didn't use it so I thought I would use it in today's card. Both stamps are from Hero Arts Clear Design stamps. They are the K & M letter sets. 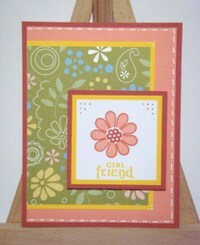 I used the small flower stamp in the K set to stamp the background. EDITED: I realised after posting this that I hadn't taken a photo of the completed card (the two bits on the right hand side are missing. Once my camera is charged up, I will update with finished card - oooops !! Here is Jen's sketch. She added the heart embellishment to coincide with Valentines Day but I didn't want to use it this time. Ink: Versafine - Onyx Black, SU! - Gable Green. Paper: SU! - Gable Green, Basic Black, Regal Rose, Certainly Celery, Whisper White, SU! DP - Petals & Paisley. Accessories: SU! - Brads, SU! - Certainly Celery Grosgrain Ribbon. It is Friday again and that means Sketch Challenge time. I thought I would use my Bella stamps today. I am pleased with the result - it is nice and bright and happy. Here are the "Javabella" girls. Aren't they great ! Ink: Brilliance Black Stazon, SU! Markers - Blush Blossom, Close to Cocoa, Creamy Caramel, Basic Black, Tempting Turquoise, Regal Rose, Bashful Blue. Paper: SU! - Tempting Turquoise, Regal Rose, Whisper White SU! DP - Petals & Paisley. 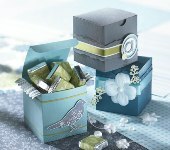 Accessories: White Satin Ribbon, Rectangle Nestabilities. Ohhh, isn't he cute !! 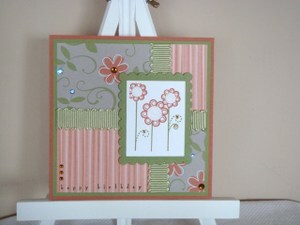 I also used my cuttlebug baby embossing folder for the background. Stamps: SU! - Bundle Of Joy. Ink: Tempting Turquoise. Always Artichoke Marker. Paper: Temping Turquoise, Always Artichoke, Sahara Sand. 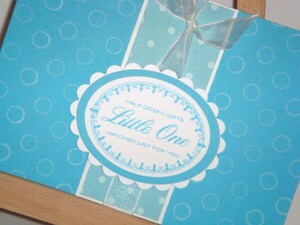 Accessories: 1/4" Tempting Turquoise Grosgrain Ribbon, Tempting Turquoise Brads, Cuttlebug- Baby Embossing Folder. Not long after my last post, I checked Beate's blog and there was her sketch. Brilliant, I thought, I'm on a roll here. 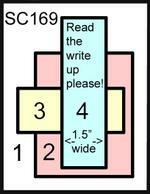 I cannot take credit for the idea of the film strip - it came from Jayne Mercer. Check out her blog. I used my nestabilities to cut and emboss the square shapes. If you take a closer look I think you can see the embossing. 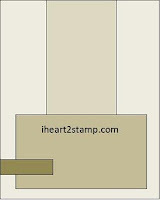 I used a post-it note to mask the bottom of the square so the image didn't go over the embossed area. I really should have made the black strip a little bit wider or I could have cut the Old Olive square's smaller but I couldn't be bothered as I know I would not have gotten all the squares the exact same size (I'm very particular with things matching and a perfectionist). I decided to use my SU! round tab punch for the sentiment with a lovely gem brad. I put a foam pad underneath to hold it in place and also to give it a lift. This is Beate's sketch - how did I do ??? Stamps: SU! - Oh, So Lovely. Ink: SU! - Pumpkin Pie, Old Olive. Accessories: SU! - 1/4" Pumpkin Pie Grosgrain Ribbon, Round Tab Punch, Papermania Green Gem Brads. It is Friday again and that means challenge day. There are two today - DCM and Beate's Weekend Sketch Challenge. Beate hasn't uploaded her sketch yet so I made a start on the DCM challenge. This week's and next week's dare are team dares - and we've decided to go nice and easy on you guys, as the past few dares have been pretty tricky ! This week, we decided on a colour combination for a change. We want you to design a card using only RED AND WHITE on your cards- it doesn't have to be a Valentine themed card - it can be any theme- as long as use incorporate RED and WHITE on it. So there you go ! Not too bad really eh? I really like how this turned out. It is not something I would normally put together just by themselves but I LIKE it. It is bright and fresh and the sun is shinning here in the SE of England at the moment which makes me happy and cheerful. Hello to all the new people that have been reading my blog over the past few days. Allison of Stampin' When I Can advertised my blog on Wednesday 30th January 2008 (you have to scroll down to find it) along with some others in the "newly discovered" section. She has different section posts each day - a great way to find new blogs to read and inspire you. Check it out. Thank you Allison. Stamps: SU! - Blooming With Happiness. Ink: SU! - Real Red. Paper: SU! - Real Red, Whisper White. Accessories: 5/8" Grosgrain Ribbon (from John Lewis), Bazzil Flowers, White Buttons Stickles - Diamond. .........That I Love You ? 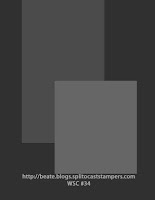 I was going to have a go at Tuesday Colour Combination on SCS but I did not have 'Going Gray' (I'm not sure if the UK have 'going gray' well, I didn't see it in the catalogue) but I might use basic black instead. Anyway, I decided to have a play with my Unfrogettable stamp set. 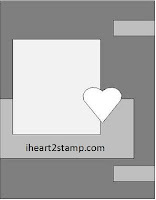 I also used my new cuttlebug heart block embossing folder that I bought last week on my day out. I rubbed my ink pads (pumpkin pie, old olive) over the embossed cardstock. Can you see the googly eyes ??? Ink: SU! - Old Olive, Pumpkin Pie, Versamark, SU! Marker - Real Red. Paper: SU! - Whisper White, Pumpkin Pie, Old Olive. Accessories: 1/4" Pumpkin Pie Grosgrain Ribbon, Circle Nestabilities - scalloped and plain, Googly eyes, Cuttlebug - Heart Blocks Embossing Folder. Here is Jen's sketch for this week. If you haven't already, go and check out her BLOG. This past week, she had been posting "Anything But A Card". There have been some great ideas and projects. I expecially LOVE the luggage tags. Here is my take on the sketch. The recipient is an adult who loves sports. I bought this paper yesterday too. I used my new chocolate chip 5/8" grosgrain ribbon and tied brown organza ribbon to look like the knot. Do you like my new easel ?? I bought it from Hobby Craft. It came with a canvas too (7" x 5") which my little Oliver painted today. He had an absolute ball. Anyway, now I have something to sit my cards on to display. Just a close up shot of the ribbon and the paper. Ink: SU! - Chocolate Chip. Paper: Karen Foster Design - Boy Playtime, SU! - Close to Cocoa, Chocolate Chip, White. Accessories: SU! - Chocolate Chip Grosgrain Ribbon. Today is Jen's Sketch For You To Try. I decided to make a male card as I have some male birthday's coming up. I wasn't sure if I was happy with how it turned out but it is growing on me !! The warm wishes stamp is by Hero Arts. It is a set of 6 greetings. Stamps: Hero Arts - Happy Everything Greetings, The English Stamp Company - Car. Ink: SU! - Old Olive, SU! Marker - Night of Navy. Paper: White, Orange, Bazzil - Blue, Green. Accessories: Blue Buttons, White Satin Ribbon, Green Brads. Another of Beate's fabulous challenges. I decided to go BRIGHT this time !!! I used the Blooming with Happiness stamp set from SU! I have not used them before and have sooooo wanted to. A friend of mine is having a birthday at the end of this month so I will give this to her. I hope she likes it. I am trying to find a solution to my lighting problem. Arrrhhh. Ink: Versafine Black Onyx. SU! Markers - So Saffron, Tempting Turquoise, Pink Passion. Paper: SU! - So Saffron, Pixie Pink, Pink Passion, Tempting Turquoise. Accessories: Pink Organza Ribbon, Bazzil Wings Bitty Blossoms (pink & blue). 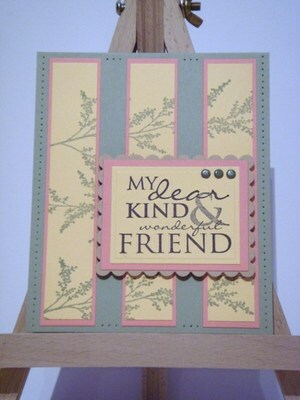 This weeks challenge for Daring Cardmakers is - Hide & Seek. Okay, for my dare we're heading to the playground for a game of Hide & Seek. 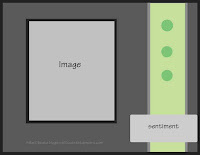 I'd like you to make a card which has a hidden component of some sort. 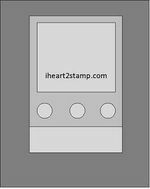 The hidden part could be a tag, a concealed photo, message or something along those lines, maybe a pull-out or pop-up. Anything goes as long as there's something extra for the recipient to find on your card that's not immediately visible when they open the envelope. I used my lovely basic grey paper. Here is the sleeve and the tag together. The sleeve needs something else but I just don't know what - yet !! Stamps: Anita's Butterfly, SU! - Welcoming Words, Hero Arts - Happy Everything Greetings. 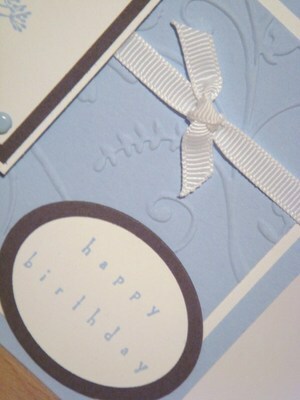 Paper: Bazzill cardstock, Basic Grey (Urban Couture). Accessories: Bazzill Wings (Bitty Blossoms Flowers (Green & Brown), Tan Brad, Sticker Circle Scalloped Nestabilities.